These waffles will turn out very different (and not as delicious!) if you use buckwheat flour instead of making fresh buckwheat flour from buckwheat groats. Pre-packaged buckwheat flour can turn rancid very fast and can have a strong flavor. Also make sure you don’t use toasted buckwheat groats in place of raw buckwheat groats. The toasted kind is called kasha and will yield very different results. 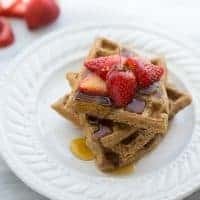 I love to make a double batch of these waffles and freeze some for later. They are delicious toasted right out of the freezer for on-the-go breakfasts. Try spreading a toasted waffle with chocolate hazelnut spread – yum! Place the buckwheat groats in the jar of a high-speed blender. Blend into a very fine flour. This might take a few minutes and require stopping the blender and shaking the container to get everything completely smooth. Pour the flour into a bowl and add the coconut sugar, baking powder, baking soda, salt and cinnamon. Mix to evenly combine. In a glass measuring cup, add the almond milk (be sure it isn’t cold so the coconut oil doesn’t solidify), cider vinegar, vanilla extract and egg. Mix to combine. Pour the almond milk mixture into the dry ingredients along with the coconut oil. Stir to evenly combine. Preheat a waffle iron and light grease with cooking spray. Cook waffles according to the manufacturers instructions. (I usually cook my waffles for 3-4 minutes in this waffle iron). Serve immediately with toppings of choice. Leftover waffles freeze great! Just let them cool and put in a ziploc bag. Frozen waffles can be toasted directly from the freezer.